In December 2002, Healthy Hawai‘i Coalition (HHC) was awarded a grant from the Kailua Bay Advisory Council to research, develop, and implement a curriculum for teaching keiki about the importance of preserving our limited water resources in the Windward side of Oahu, traditionally known by Hawai‘ians as Ko’olaupoko. HHC Vice President Tulsi Gabbard, along with other HHC volunteers, created the original curriculum for The Hawai‘i Watershed Experience. 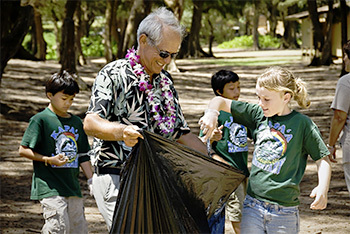 Based on themes from watershed awareness programs from the mainland, this curriculum was adapted specifically for Hawai‘i. The curriculum for The Hawai‘i Watershed Experience integrates drama, field experiences, visual demonstrations, record keeping, chemistry, conservation themes, problem solving, art, and music to accommodate various learning abilities. In 2004, the Hawa‘ii State Department of Health, Clean Water Branch and the U.S. Environmental Protection Agency jointly granted funds (under Section 319(h) of the Clean Water Act) to HHC to expand the program to reach Pearl Harbor and West Maui. In 2005, an additional 319(h) grant enabled The Hawai‘i Watershed Experience to make special presentations on Kauai and Molokai, as well as the North Shore and Windward side of Oahu. Beginning in 2010, HHC is now able to offer The Hawai‘i Watershed Experience to public and private schools on every island. The HHC team has brought The Hawai‘i Watershed Experience to over 50 elementary Schools and camp programs, reaching over 5,000 students. An in-class introduction. Using students as helpers, a visual demonstration shows how non-point source pollution can accumulate in streams and bays. 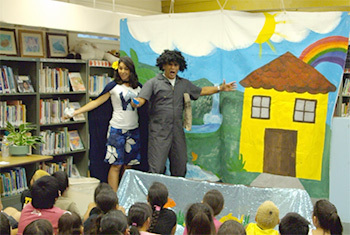 A play starring WaterWoman and Oily Al is performed. WaterWoman has to repeatedly correct her dirty, careless neighbor Oily Al from his watershed-damaging behaviors. The students learn along with Oily Al how to apply WaterWoman’s teachings to their own lives. The second day of the program involves a field trip to a watershed area close to each participating school. During the field trip the students engage in 4 activities to further their understanding and experience of their community’s unique watershed. Students experiment with water quality testing, activity book work to reinforce the program's main themes, observation of the effects of various kinds of pollution and erosion on a watershed model, and pollution clean up with lessons on recycling. Read some of the enthusiastic responses from teachers and students about The Hawai‘i Watershed Experience. If you are a teacher, principal, or parent interested in bringing The Hawai‘i Watershed Experience program to your school, please email us at gmgabbard@gmail.com.